A night on the town doesn't need to derail your diet -- as long as you choose your cocktails carefully and consume them in moderation. One way to go is to order a vodka soda. Vodka is America's favorite spirit, accounting for 32 percent of all sales in 2012, according to the Distilled Spirits Council of the United States. When paired with a calorie-free mixer such as soda water, vodka can make for a low-guilt beverage. The only calories in a vodka soda, which is made from vodka and soda water, come from the liquor itself. One fluid ounce of vodka contains 64 calories, according to the USDA National Nutrient Database. Your cocktail will vary slightly in calories depending on how much vodka the bartender pours. Soda water is calorie-free. 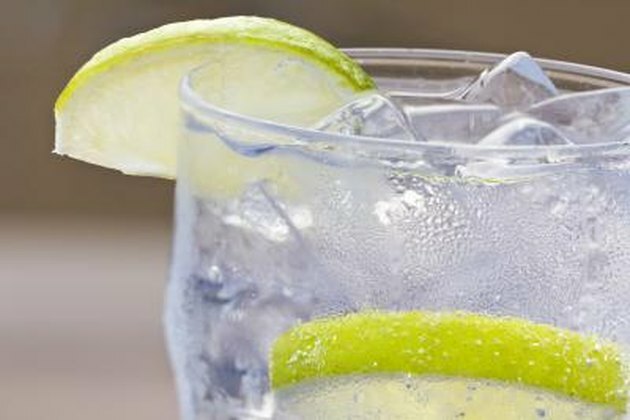 Just be sure not to mix your vodka with tonic water, which is clear and fizzy like soda water, but contains 83 calories and 21.5 grams of sugar per serving. A squeeze of lemon or lime to flavor your drink will add just a couple extra calories. Shape: Diet Strategies: Which Drink Has Fewer Calories?